Stanford University scientists have invented the first high-performance aluminum battery that's fast-charging, long-lasting and inexpensive. Researchers say the new technology offers a safe alternative to many commercial batteries in wide use today. Dai and his colleagues describe their novel aluminum-ion battery in "An ultrafast rechargeable aluminum-ion battery," in the April 6 advance online edition of the journal Nature. "In our study, we have videos showing that you can drill through the aluminum battery pouch, and it will continue working for a while longer without catching fire," Dai said. "But lithium batteries can go off in an unpredictable manner - in the air, the car or in your pocket. Besides safety, we have achieved major breakthroughs in aluminum battery performance." Durability is another important factor. 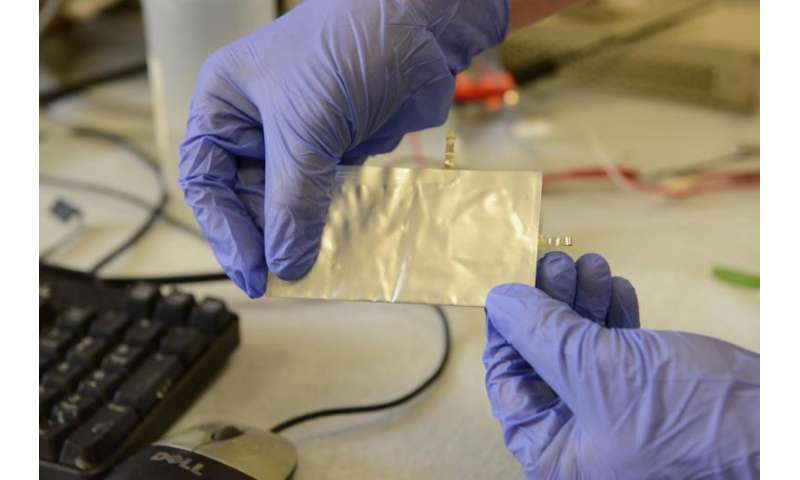 Aluminum batteries developed at other laboratories usually died after just 100 charge-discharge cycles. But the Stanford battery was able to withstand more than 7,500 cycles without any loss of capacity. 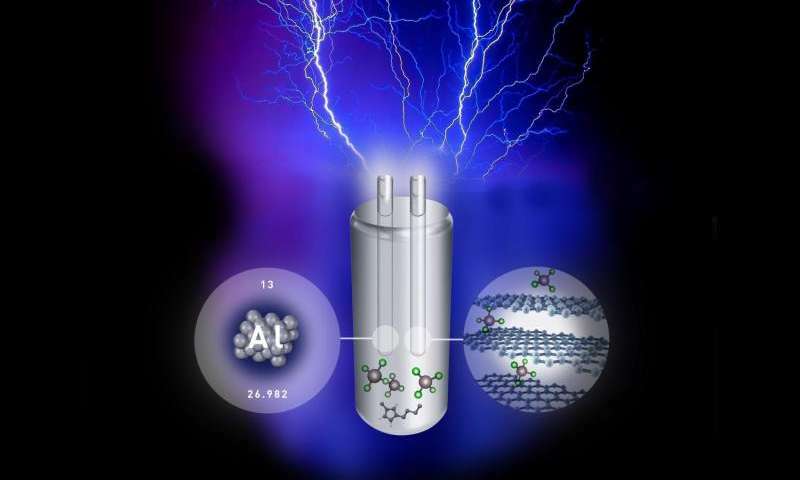 "This was the first time an ultra-fast aluminum-ion battery was constructed with stability over thousands of cycles," the authors wrote. In addition to small electronic devices, aluminum batteries could be used to store renewable energy on the electrical grid, Dai said. "The grid needs a battery with a long cycle life that can rapidly store and release energy," he explained. "Our latest unpublished data suggest that an aluminum battery can be recharged tens of thousands of times. It's hard to imagine building a huge lithium-ion battery for grid storage." Aluminum-ion technology also offers an environmentally friendly alternative to disposable alkaline batteries, Dai said. "Millions of consumers use 1.5-volt AA and AAA batteries," he said. "Our rechargeable aluminum battery generates about two volts of electricity. That's higher than anyone has achieved with aluminum." For stationary applications, the energy density is not an issue, as long as it's somewhat reasonable. Too bad the journal reference link is broken. I'd like to find more about it. The article gives all the specs except how long the battery will power various gadgets. We need a battery that once charged will power, say a smart phone, for a week of continuous use. They did use 1-ethyl-3- methylimidazolium chloride [EMIm]Cl / AlCl3 (40/60 mol.-%) electrolyte, similar one, which is already used for electrodeposition of aluminum layers from aqueous solutions. The resulting capacity is 85 Ah/kg (about half of one achieved with LiION batteries). Given the fact, that lithium is strategic metal for electromobility, this stuff looks pretty interesting. It says it's about half as powerful as a standard lithium, and has a current max output of ~2v. So right now that's about as good as 1 AA battery, but probably about twice the size. It depends on type of battery. The rechargeable lithium AA batteries tend to have lower capacity and also voltage, so you shouldn't compare the aluminum accumulators with non-recheargable battery. It also depends on gadget used. You shouldn't consider the Apple Watch or another mobile hand warmer, the supplementary function of which is to show something at display. Or you may want to wait for cold fusion thermoelectric batteries in Terminator T-100 style. Utilizing Services of Foreigners, eh? Just use 2 Batteries side by side, Folks! What is Tesla's take on this? Aluminum Body, Aluminum Battery, WoW. 1 Million of them per car should suffice! This is graphene technology...Aluminum is a dopant. Why do you think so? The aluminium doesn't form intercalates with graphite with compare to lithium.. The aluminium atoms are large, they don't fit between graphene layers. "We need a battery that once charged will power, say a smart phone, for a week of continuous use." Wow we are getting more ignorant by the minute!!!! Out of all the possible uses for a cheap battery that can be recharged 10K times a cell phone is offered as the most pressing need. Just thought I'd mention The International Union of Pure and Applied Chemistry (IUPAC) officially standardised on the name "aluminium" in 1990. The other spelling is considered for laymen, though the discoverer of Aluminium did call it Aluminum at one point, then changed it. If they want to match 3.7V DC, they could series join two 2V DC Aluminium ion battery. Follow the bouncing baby link at the bottom of the article. The numbers are right there. It's not just the size of the ions that determines whether they fit between the layers, it is also the ionisation energy. In this case, they are intercalating the graphite with AlCl4 when charging. This looks promising for home energy storage so I've started experimenting on this idea myself and if I get any good results I want to just share them with everybody for free. Now that the DOI link works, we can see that it has a specific energy density of around 140 Wh/kg which is comparable to early lithium-ion batteries. In comparison, a Tesla 85 kWh battery pack has approximately 150 Wh/kg including all the supporting structures, which amount to about a third of the mass. The plain cells should come in at around 230-250 Wh/kg. This is the reason why it's important to get the cell voltage up - the higher the voltage, the higher the specific energy density. As it stands though, the invention has important implications for other automotive applications, like car starter batteries because the very high discharge rate and long cycle life may directly replace lead-acid batteries. Even the 2 V cell voltage is a direct drop-in replacement, because car batteries are 6x 2 V cells in series. Also if the battery is as resistant to catastrophic as claimed the cooling and packaging weights could be lowered substantially. I don't have access to the full text of the Nature article. Does anyone know what the dod ( depth-of-discharge) was for the 7500 cycle lifetime? Industrial deep-cycle lead-acid batteries are typically spec'd at 1000 cycles at 50% dod. If the technology reported here can do 50% or better for 7500 cycles and has a reasonably low self-discharge rate, it starts looking very good for utility-scale applications to buffer PV and wind generation. If the battery can do 80% dod, the cost comes down to 1.2c/kwh. 7000 cycles... you can't fully test that in lab in short period of time. Eg battery in real world could fail in matter of months from other factors. Lithium batteries, often get 80%+ energy out of them compared to putting in, some aluminium techs you put in several times as much energy to charge them/recycle as get out after.... not so important for cell phone but important for car/stationary. weight... important for cell phone, probably 2x+ as much weight. It is a big shame that each house does not have its own power with a battery capturing energy from sun for the nights too....A big shame to endure power outages....! Probably, so many things can be done differently but for the Greedy Corporations. Corporations may be doing good but certainly could do better. One Example I can give is Hoarding of Funds in Swiss Banks without using that for ESC Research, Infrastructure Whatever. Another Example I can give is pouring money into religion related activities in this Modern era of Science & Technology. One More Example I can give is letting Carnivores Prey on Herbivores which could be utilized for humans...food, fish (vs. crocs), biofuel....What Not! To tell the truth, Why Dinosaur sized Whales Too! We could have gotten double the amount of fish....So, at 1/4 the current price on the dinner table! It is a big shame that each house does not have its own power with a battery capturing energy from sun for the nights too......A big shame to endure power outages....! READ: "New report identifies possible next steps in US energy development" ; "In the U.S. we don't really understand much about energy: where it comes from, the scale of demand or the benefits and challenges of producing different kinds of energy." said Scott Tinker, Director of the Bureau of Economy Geology at the University of Texas at Austin, and State Geologist of Texas, "I don't know where things will stand 50 years from now, but I do know that, like today, we are still going to be looking for sources that are affordable, accessible, reliable and sustainable. Those tenets will drive the energy mix, whatever it turns out to be." (We have had claims of supercapacitors that could handle 2000+ volts rather than just 3 volts for years which in own way would accomplish similar... and many years later none in market. "Probably, so many things can be done differently but for the Greedy Corporations." Good god people you do not have even the slightest idea of what is possible on a cost effective basis. You think that any product that you can imagine would be affordable but for greed. Why not? Two minutes per cycle takes only 10 days. Does anyone know what the dod ( depth-of-discharge) was for the 7500 cycle lifetime? It appears they ran it down all the way to 0 V, so 100% DoD. The current lithium-ion batteries aren't shielded properly to start with. Tesla had to add more armor to the bottom of the car, and they don't count that towards the weight of the battery pack because it's structural to the car's chassis. "It appears they ran it down all the way to 0 V, so 100% DoD." Well most batteries loose a lot of life expectancy when discharged 100% so this was really an extreme test. Good for them, I really hope that this is the breakthrough that we all have been looking for. Well most batteries loose a lot of life expectancy when discharged 100% so this was really an extreme test. Maybe it needs to be discharged completely. They're basically electroplating a graphite electrode with aluminium, and if it's not completely cleared with each discharge and the aluminium returned back to solution, maybe it starts to form lumps and dendrites. It's too early to say before they put it through the mill and see what comes out. The discharge curve has an interesting double plateau, first above 2 V and the second at 1.7 V at about 80% DoD indicating that there's two kinds of reactions going on. First something gets deposited, and then something else gets deposited on top of that, and each has a different treshold voltage. Not sure if I'm allowed to do this, oh well. Actually it is only a new kind of supercapacitor, even though they claimed that it was an aluminum ion battery. It is the ionic liquid electrolyte (EMImAlCl4) that reacts with (AlCl4- anions intercalate into) graphite foil under moderate voltage, not Al3+ cations from Al electrode. If the Al electrode is replaced by other stable metal or graphite, the results should be the same. Compared with other real aluminum ion battery (Chem. Commun., 2011, 47, 12610–12612), its specific capacity is too low (60 vs 273 mAh/g). As a supercapacitor, its specific capacitance is only 4A/g*54s/(2.45-0.4V)=105.4 F/g. I can only smile on this "Nature" paper. It doesn't behave like a capacitor. If it was acting as a capacitor, the voltage would depend on the collected charge instead of the electrochemical potential of the electrode materials, and there would be no voltage plateau in charging or discharging. What you said is mainly based on Electrical double-layer capacitors （EDLC), not pseudocapacitors.Electrochemical pseudocapacitors use metal oxide or conducting polymer electrodes with a high amount of electrochemical pseudocapacitance. Pseudocapacitance achieved by Faradaic electron charge-transfer with redox reactions, intercalation or electrosorption. (from Wikipedia) You can always find voltage plateaus in charging and discharging. Please check papers J. Mater. Chem. A, 2014, 2, 3223-3230 or doi:10.1038/srep01470. Apparently this battery will support high discharge rates, based on the charge rate data. Now if only the energy density is at least twice that of the lith-ion technology, we are really on to something for electric cars that have enough range to make them truly feasible for general use. I hope we get there before we get asymptotic to the laws of chem and physics. What you said is mainly based on Electrical double-layer capacitors (EDLC), not pseudocapacitors. As a supercapacitor, its specific capacitance is only 4A/g*54s/(2.45-0.4V)=105.4 F/g. I can only smile on this "Nature" paper. That's still 58 Wh/kg at 2 Volts, which is equivalent to NiCD/NiMH batteries. If it was a supercapacitor, it would be a world record with 4-5 times greater energy density than preceding attempts. Clearly the claim that it's "only a capacitor" doesn't pass the straight face test. The numbers sound too incredible, so I think you're mistaken. Come on, buddy! you cannot judge the type of energy storage devices by calculating the energy density. It makes no sense. The mechanism functioning inside the devices determines the type. In conventional batteries, ions (Li+, Na+ and Mg2+, et al) continuously migrate from one electrode to another through electrolytes during charging-discharging cycles while the electrolytes remain stable. In supercapacitors, the ions from the electrolytes (not dissolve from counter electrode) insert into active materials or are adsorbed on the surface, and the electrolyte is polarized. With regard to this paper, the AlCl3 (or AlCl4- cations) from AlCl3/[EMIm]Cl electrolyte intercalated into graphite. The counter Al electrode can not compensate the AlCl3 or AlCl4- ions consumed during charging. So I have to say the device is more a two-electrode supercapacitor than a real Aluminium-ion battery. You can't simply use the specific capacity equation to derive the specific capacitance. What if the voltage window was (2.45-2V)? You'd then get 480 F/g...! I think you're right though, it seems like there are extrinsic pseudocapacitive effects happening where the anion goes into the graphite, allowing fast charging and the like. I'd like to make up an iodoaluminate ionic liquid and try that as the electrolyte to increase the voltage. But for now it's a case of focussed study on the growth of these crystalline graphite structures with the overarching aim to build them cheap and (relatively) easily. The counter Al electrode can not compensate the AlCl3 or AlCl4- ions consumed during charging. It takes 7AlCl4- ions to 1Al atom to release the electrons, so it seems like galvanic oxidation only has to compensate at 1/7th the speed of intercalation, (don't quote me on that, ha) but it is still probably a limiting/contributing factor during charge/discharge. we need to analyze what happened to the anode and cathode during the charge and subsequent discharge process. No Al atoms from Al electrode really participate in the reaction. It is the electrolyte that reacts with graphite, not Al atoms from Al electrode. So you can replace the Al electrode with other metal or graphite, under moderate voltage, you can get the similar electrochemical performance. Then, what kind of device are you making? 3 to 4 Good news reports on batteries recently; 1 by Google X , 1 by S. Carolina, Another one is this current one. New material could boost batteries' power, help power plants. A team of researchers, including Kyle Brinkman of Clemson University, developed a material that acts as a superhighway for ions. Ye Lin, Shumin Fang and Fanglin Chen, all of the University of South Carolina, collaborated with Brinkman and Dong Su, who is with the Center for Functional Nanomaterials at Brookhaven National Laboratory in Upton, New York. Come on, buddy! you cannot judge the type of energy storage devices by calculating the energy density. It makes no sense. If you say it's a supercapacitor, wouldn't it ought to act like one and have energy densities at least similiar to other supercapacitors? Unless you claim they've actually found a super-super capacitor.